The Dark Art of Distilling Whiskey. A lovely trip to Kilkenny that was hugely enhanced by a visit to Ballykeefe Distillery, Callan, Co Kilkenny. This is a new whiskey distillery, Morgan Ging filled his first casks in 2016. He had a long held desire to open a distillery in the Family Farm Distillery tradition. Way back in Ireland the landscape was dotted with family farm distilleries. The farmers grew their own grain for the distillery and produced their own whiskey and then fed the highly nutritious leftovers to their cattle. Anything the cattle couldn’t eat was used to fertilise the land.This tradition continues in Ballykeefe Distillery, the Ging family grow their own barley for the distilling process from which they make whiskey, vodka, gin and poitín. They also source their water from their own aquifers. Morgan Ging’s family has been farming for a few hundred years so you can expect that he knows something about farming. They brought over award winner and walking encyclopedia of distilling knowledge, Jamie Baggott, to distill and eek out the best flavours of their Ballykeefe whiskey, gin, vodka and poitín. Stepping inside the visitors centre the interior is lightened up with a series of well designed displays explaining the history and process of whiskey. And even mentions the gem that the earliest reference to whiskey distilling known, is in the 700 year old Red Book of Ossory, where three vellum pages of the text are given over to the distillation of Uisce Beatha (Water of Life i.e. whiskey.) So Kilkenny is officially the source of whiskey making. So much history behind Ballykeefe. It was here I met Master Distiller Jamie Baggott. Jamie comes from Herefordshire in England and is an international award winner for his distillations. His intimate knowledge of the process is astounding. Jamie brought me around the distillery explaining the process from start to finish. A group of four French whiskey enthusiasts joined us for the tour. Ethanol flows clearly at the 'Cut'. Jamie Baggott assesses the cut. The mash is heated in the beautiful copper stills and the different alcohols are removed and kept as required. The ‘Cut’ is where the bad alcohols are separated form the good ones. I found this fascinating. The first type of alcohol, methanol comes off at 64.7ºC. Quickly followed by acetone. Both have their uses but this is the stuff that made poitín makers blind in the past. After some time and an increase in temperature of the mash the good good alcohol, the heart - ethanol, pours out. The volume of alcohol is 78.1º at this stage and is suitable for the next stage of the process. This goes on to become whiskey. Some of the Ballykeefe Distillery product. The alcohol is put into bourbon barrels to age for a minimum of three years and gives the whiskey its colour. 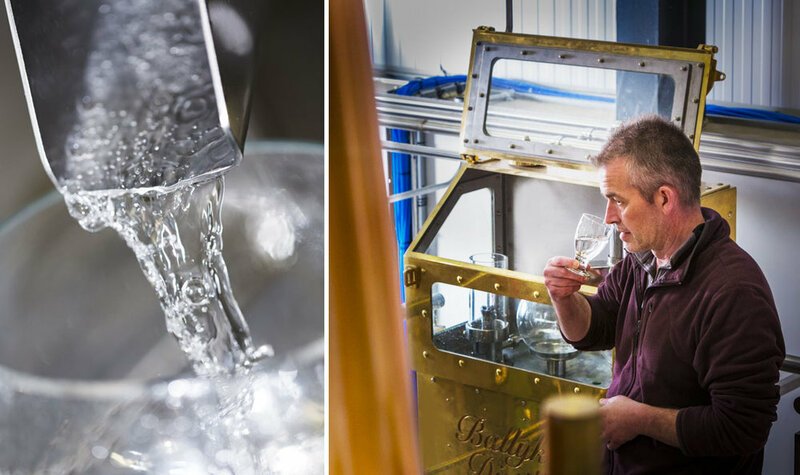 For gin - Jamie uses his talent to vapour infuse high quality botanics into the finest quality potato spirit that can be sourced, already 6 times distilled it is then distilled a further 6 times through the bespoke copper rectification column and hey presto we’ve got the highly regarded Ballykeefe Dry Gin. The vodka is bottled from the very same alcohol as used for the gin with nothing added. After all Gin is essentially flavoured vodka. If I remember a fraction of the knowledge that Jamie passed on during that visit I would be impressed. He made the trip a wonderful experience. So next time you are in the area you know what to do. And it makes a lovely day trip from Dublin, about two hours by car, just outside Kilkenny. (L-R) Whiskey ageing in bourbon barrels. Morgan Ging founder of Ballykeefe Distillery. Jamie Baggott Master Distiller.